Once the meetings are done for the day and the presentations are finished, it's time to relax, kick back, and spend some quality time networking with your associates. In other words, it's time to PARTY! 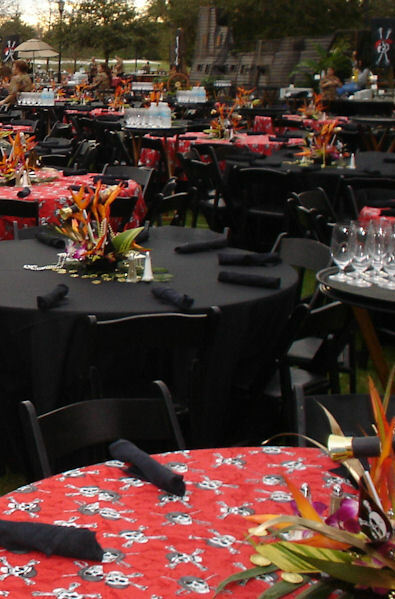 If your boss has put you in charge of planning your corporate party, awards ceremony, or company picnic, we'll make sure you look good! We'll work together to ensure you get the party that suits your needs and vision. Whether it's a Pirate themed event as seen in the picture on the left, Beach Party, a 1920's Casino, a 1950's Sock Hop, a Studio 54 Disco, a time warp into the 80's, a sophisticated night of jazz or a modern day nightclub, we have the expertise to make the night a huge success with the perfect music. We feature crowd interaction that is sure to get everyone involved. We customize each show to give our clients exactly what they want. Whether its a large corporate party or a small office get together, you can relax, we can make it perfect. We have many different games and contests to make the night fun or, if you prefer, we can maintain a low profile with music designed to soothe and relax. Because at Forte Talent, we cater specifically to you!